Today I received a really lovely email from Glitzy Secrets complimenting the Oxfam post I published earlier this week..They invited me to submit a vintage inspired OOTE (outfit of the era!) to their competition page. I thought to tie in with the Oxfam post I should put together an outfit of pieces I've purchased from a charity shop! I purchased this rather bright number from a charity shop about 3 years ago for £10. I've never really found an occasion to wear it to.. anyone having a tea party I can come along to?! I love these vintage Hush Puppies wedges that I picked up from a charity shop for £5- bargain! Before planning my outfit I visited Glitzy Secrets website and used their new 'Find your style era' tool to get an idea on what type of look I should try and create. The 'find my era' tool they have put together is a really quick quiz you can take to work out what era of fashion best suits your style. You can then go and shop for their jewellery that would best match your vintage inspired outfit! I got the 50's of course, voluptuous hair,red lips,curvy figure and full skirts! I would say my outfit is 40's-50's style wouldn't you!? Just to note.. isn't my bike THE cutest thing?! 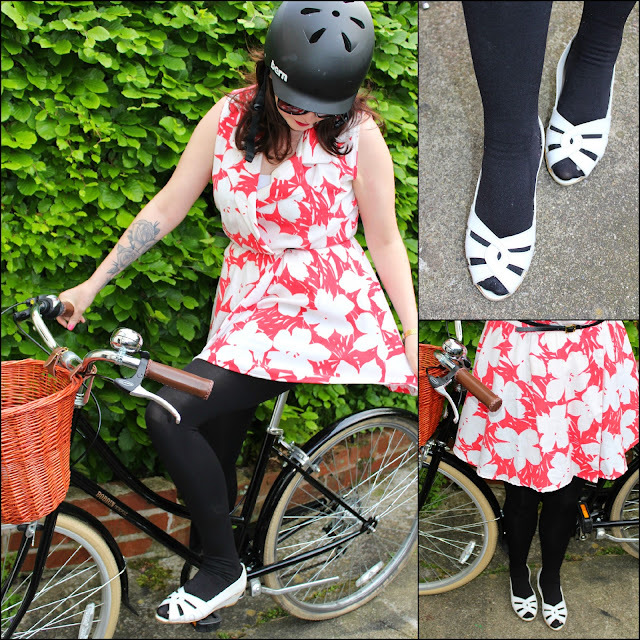 Its a Bobbin Metropole with a Bobbin basket on the front... so in love with this- probably the best purchase I've ever made.. getting some exercise and looking cute all rolled into one!